Both on here and over on my Youtube channel I'm always surprised by how much attention my hair gets. I actually do very little to my hair as I've always hated it no matter what I've done, especially since I made the terrible mistake of dying it black a couple of years ago now. I've struggled with getting it to grow and keeping it healthy whilst still achieving a semi-messy 'bedhead' kind of look that I've lusted after for years now so I thought I'd let you in on one of the products that helps me in my (pretty impossible) quest. I have really fine hair but lots of it - if that makes any sense at all! Naturally it's quite straight and only has a very slight wave even when air dried, so getting it to look voluminous and undone can be quite a task, but naturally that's the look I've fallen in love with! 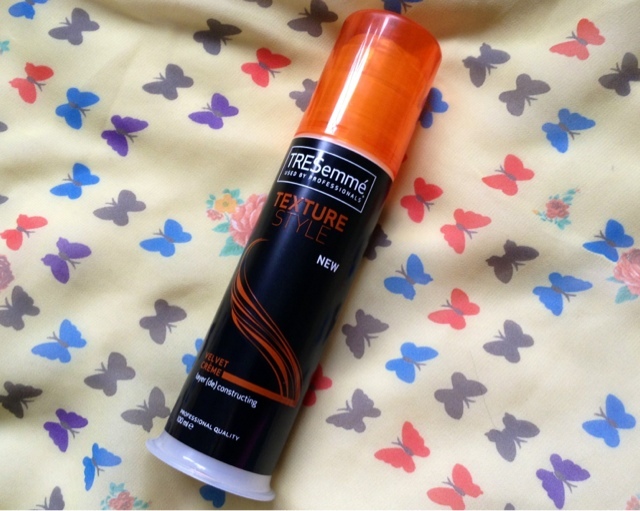 Texture creme's have caught my eye a lot recently as I feel I've had my share of using texturising sprays and mists that seem to do very little. I love the idea of a creme as although I thought they may weigh my hair down if I apply too much, they've always looked a little more effective in giving the hair texture. I was initially after the Bumble & Bumble Bb Texture (un)Dressing Creme which retails at £21.50, but I decided to settle for this cheaper option first as I couldn't justify spending such a hefty sum on a hair styling product before I was sure the formula would work for me. Although it's not a definite dupe, Tesemme's Velvet Creme seems to work in a similar way; promising a dishevelled look with a matte finish. I've been using this for a little while now and it's taken me a little while to find my niche with it. To begin with I was applying this on dry hair after styling to give my 'do a messier finish, but I did find this made my hair a little sticky in some places and I had to be extremely careful when applying it so that it was evenly distributed. Since then however I've experimented with using it on towel dried hair, a method that seems to work better for me personally. After washing my locks I apply mousse to the roots, oil to the very ends and this in the mid-lengths. The instructions tell you to begin with a pea sized amount and rub it between your fingers before applying which is exactly what I do. This product is really easy to work with on damp hair and you can build it up a lot easier too; I usually apply 4 or 5 pea sized amounts to the lengths before achieving my desired amount of texture. I then leave my hair to air dry, scrunching the ends every now and again in order to promote a natural looking wave. I find that once my hair is completely dry I'm left with a full, softly tousled style with a semi-matte finish. This product doesn't weigh my hair down - nor does it make it feel dry or rough - and it's incredibly easy to wash out. This has become a staple part of my hair routine and I'm chuffed that I can finally stop using heated tools again for the time being. I may still look into the Bumble & Bumble version in the future but for now I'm really happy with how this works and for the price you really can't go wrong!